The first thing that struck me about this book, covering the food of North Africa, was its complete lack of pictures. Apart from the odd very instructive illustration here and there, there are no pictures at all, no photos of celebrity chefs mugging for the camera, no artfully arranged plates of food, no soft focus shots of the Sahara. quickly won me over with its quiet authority and brilliantly contextualised recipes. It reminds me a little of Claudia Roden’s magnificent The Book of Jewish Food, which is a masterclass in associating food with culture, people and place. North African Cookery has the same keen sense of history and context, an understanding of what makes food important to the people who cook it and eat it. It appreciated that food is more than mere nourishment, it’s the stuff of life itself. 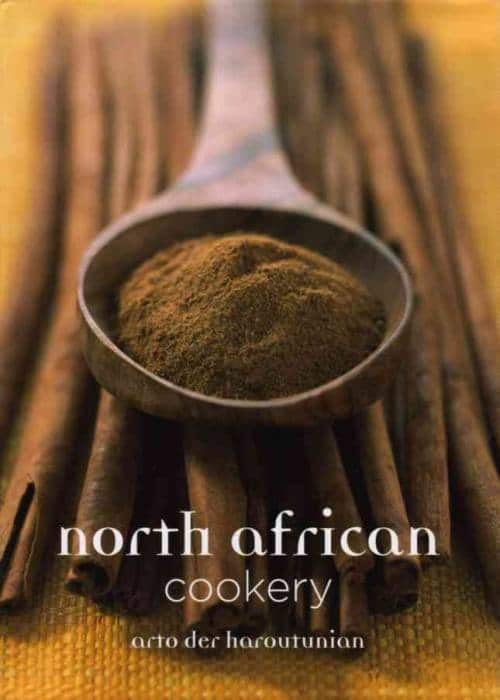 North African food stretches far beyond the Moroccan standards that might be familiar, and this book does a great job of encompassing the rest of the Maghreb, the coastal Mediterranean stretch covering Morocco, Algeria, Tunisia and Libya. The food is a mix of Arab, African and Mediterranean characteristics, strongly influenced by Berber and Bedouin traditions and methods. It’s the Berber legacy in particular that shapes much of the food of the Maghreb, with its couscous, tajines and use of fruits in dishes, but the European influence is strong, especially from the old colonial powers of France and Italy. Der Haroutunian notes that the sweets and starters of Algeria “have more than an accidental touch of metropolitan France”. lack of pictures is made up for in its liberal use of local sayings, idioms and legends to bring the text to life. I think this is a more effective technique than a huge splash of glossy images. It helps the reader to imagine how a dish would be prepared, how it would be eaten, what it means. was first published in the eighties, but remains as bright and exciting today as it was then. Just a quick word on the series of titles this book is from…Grub Street Publishing have an excellent knack for rediscovering classic cook books and presenting them in a new and exciting way. Their current range includes titles from Elizabeth David, Marguerite Patten and Joel Robuchon, all worth a look.